The CW's Arrow and The Flash are getting ready for their big crossover event next week, which airs over two nights on December 1 and 2. Earlier this month, Arrow already gave fans a much different crossover, when they brought in Matt Ryan to reprise his role as John Constantine from NBC's canceled series Constantine in the November 4 episode entitled Haunted. A new report from Bleeding Cool reveals that The CW is considering bringing Constantine back for DC's Legends of Tomorrow, if the network orders a second season. The unconfirmed report reveals that The CW is considering radically altering the cast for each season of /dc-legends-tomorrow-negative-woman-stephanie-corneliussen/DC's Legends of Tomorrow. This model has been compared to the animated series entitled Justice League Unlimited. The network's plan is to reportedly bring on Matt Ryan as Constantine as a series regular, and the report also claims that The Vampire Diaries star Steven R. McQueen is being eyed for an unspecified role in the second season. However, the site issued an update earlier today from a different source, which claims that DC's Legends of Tomorrow might not get a second season at all. The show, which we reported last week will premiere on Thursday, January 21, is "incredibly expensive," and the network may opt to end the spinoff after one season and put a different series in its place. It isn't known what new show may replace DC's Legends of Tomorrow, but we're still nearly two months away from the premiere. In DC's Legends of Tomorrow, when heroes alone are not enough, the world needs legends. Having seen the future, one he will desperately try to prevent from happening, time-traveling rogue Rip Hunter is tasked with assembling a disparate group of both heroes and villains to confront an unstoppable threat - one in which not only the planet is at stake, but all of time itself. Can this ragtag team defeat an immortal threat unlike anything they have ever known? DC's Legends of Tomorrow stars Victor Garber as Dr. Martin Stein, Brandon Routh as Atom, Arthur Darvill as Rip Hunter, Caity Lotz as White Canary, Ciara Renee as Hawkgirl, Falk Hentschel as Hawkman and Franz Drameh as Jay Jackson, with Dominic Purcell as Heat Wave and Wentworth Miller as Captain Cold. Based on the characters from DC Comics, DC's Legends of Tomorrow is from Bonanza Productions Inc. in association with Berlanti Productions and Warner Bros. Television, with executive producers Greg Berlanti, Marc Guggenheim, Andrew Kreisberg, Phil Klemmer, Chris Fedak and Sarah Schechter serve as executive producers. Glenn Winter directed the pilot episode, from a script by Greg Berlanti, Marc Guggenheim, Andrew Kreisberg. 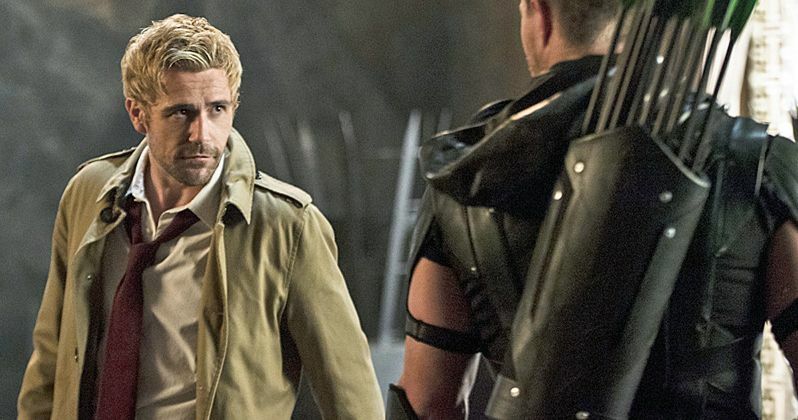 What do you think about the possibility of Matt Ryan's Constantine appearing on DC's Legends of Tomorrow?